NOAA Press Release–The annual meeting of the International Commission for the Conservation of Atlantic Tunas (ICCAT), held in Dubrovnik, Croatia, concluded this week. U.S. goals for the ICCAT meeting were focused primarily on adoption of critical conservation measures while maintaining U.S. recreational and commercial fishermen’s access to ICCAT-managed fisheries. While the United States commends ICCAT’s progress at this meeting on efforts to combat illegal, unregulated, and unreported (IUU) fishing, the Commission’s lack of progress on key conservation measures is disappointing. Earlier this year, a stock assessment confirmed that Atlantic bigeye tuna is overfished and subject to overfishing. The United States advocated strongly for the adoption of measures that would end overfishing immediately, rebuild the stock within 10 years, establish greater accountability to catch limits, and take appropriate account of the relative impact of various fisheries by reducing the catch of small bigeye tuna in purse seine fisheries. 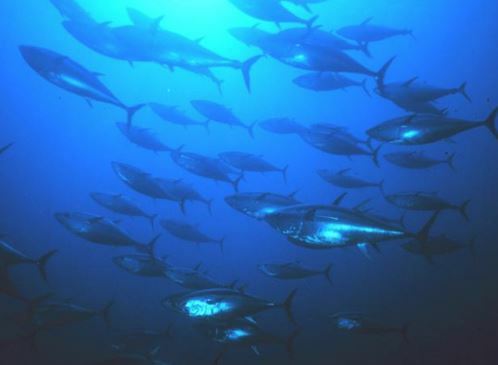 The United States is disappointed that ICCAT failed to adopt measures that will ensure the long-term sustainability of the bigeye tuna stock. The current management measures in place for tropical tunas, including bigeye tuna, were extended for 1 year. The United States also sought to advance measures for overfished blue marlin and white marlin stocks to increase post-release survivability and strengthen data collection, such as the use of circle hooks and electronic monitoring on pelagic longline vessels coupled with a requirement to release live marlins in these fisheries. These measures, and other measures to advance conservation of billfish, are already in effect in the United States but did not gain broad international support. ICCAT extended the current management measures for marlins for 1 year. The United States and cosponsors proposed several key measures at this meeting to ensure sustainable management of ICCAT fisheries and protected living marine resources. The United States, along with 25 cosponsors, proposed measures requiring fins naturally attached to sharks at the first point of landing. The United States and Canada proposed measures to prohibit intentional encirclement of cetaceans in purse seine fisheries. The United States, Panama, Cape Verde, Nicaragua, and Guatemala proposed measures to reduce the bycatch of sea turtles in longline fisheries. Unfortunately, there was no consensus among ICCAT members on these proposals. ICCAT’s continued failure to adopt measures that are critical to the sustainable management and sound conservation of ICCAT-managed fisheries and protected living marine resources is of great concern to the United States. Progress was made on several fronts. Under the leadership of the U.S. Chair of ICCAT’s Convention Amendment Working Group, and following a 10-year negotiation process, ICCAT took the significant step of endorsing the text of proposed amendments to the 1969 ICCAT Convention to reflect a precautionary and ecosystem-based approach to fisheries management; clarify the scope of the Commission’s management authority, particularly for sharks; and allow greater participation of Taiwan in ICCAT’s deliberations. After undergoing a legal review, the amendments are expected to be adopted and opened for ratification in late 2019. Concrete progress was also achieved in U.S. efforts to combat IUU fishing through port inspections, at-sea boarding, strengthened vessel monitoring systems (VMS), and IUU vessel listings. Several measures originally proposed by the United States were agreed to at this meeting after many years of development and collaboration with international partners. First, ICCAT adopted a framework for the bilateral exchange of at-sea inspectors that will help to familiarize inspectors with the boarding and inspection procedures of other ICCAT members. This voluntary program will help build capacity by providing direct experience in at-sea boarding and inspections and in post-inspection follow-up. Second is a measure that strengthens the mechanism for combating IUU fishing by requiring ICCAT members to restrict port entry and access to port services in defined circumstances, consistent with the 2009 Port State Measures Agreement. Third, ICCAT also strengthened its minimum standards for VMS on longline and purse seine vessels, increasing the frequency of data transmission and expanding the measure’s application to smaller commercial vessels that are authorized to fish in waters beyond their country’s jurisdiction. This measure will result in more precise information on fishing and fishing-related activities such as transshipment, which will support ICCAT members’ enforcement and scientific initiatives. Fourth, ICCAT adopted a measure to clarify and streamline the process to list and delist vessels as participating in IUU activities. Finally, under the leadership of the U.S. Chair of ICCAT’s Compliance Committee, ICCAT took steps to continue improving its compliance review process.